Two explosive-laden drones were used to attack Venezuelan President Nicolas Maduro earlier this month. The attack failed, and it was expected to prompt a new crackdown from the government. Maduro reportedly hinted at what may be another purge during a weekend meeting. The days since an August 4 drone attack on Venezuelan President Nicolas Maduro have yielded few solid details about the perpetrators, but Maduro’s government appears to be moving ahead with efforts to consolidate power and neutralise rivals. During the attack, two drones, each carrying 2.2 pounds of C-4 explosive, flew over an event marking the 81st anniversary of the national guard, where Maduro was speaking. Interior Minister Nestor Reverol said one was electronically diverted by security forces, while the other crashed into an apartment building nearby. The commotion and blast scattered the crowd assembled there. Seven national guardsmen were injured. Maduro and other officials were unharmed, and it appears to be the first time drones were used to target a head of state. The Venezuelan government cast blame widely. Maduro – who blames a foreign-led “economic war” for Venezuela’s problems – blamed the “far right” for the attack, working with former Colombian President Juan Manuel Santos as well as with plotters in Miami. Maduro called on President Donald Trump to hold the “terrorist group” responsible. The US and Colombian governments have both denied involvement. Santos left office on August 7, but he told The New Yorker earlier this year he was aware of groups within the Venezuelan military plotting coups and said he was not averse to such a move. A group called “Soldiers in T-shirts” appeared to claim involvement, saying on Twitter that, “We have shown [the government] is vulnerable.” Some also suspect the group of involvement in a 2017 attack in which a police officer dropped grenades on government buildings in Caracas from a helicopter. A former police chief and opposition member also claimed that he helped organise the attack, and a Miami radio host has said he was aware of the plot and that there are more coming. Former members of the military have also been accused of involvement. On August 10, Information and Communication Minister Jorge Rodriguez said that 19 people have been detained and 18 more were wanted. Maduro was seen as likely to use the attack as a pretext for another crackdown on political rivals and to purge the security forces to further consolidate his power. In a weekend meeting with senior military officials, Maduro appeared to preface such a purge, reiterating his claim of Colombian and US involvement and saying that members of the armed forces should distance themselves from family members opposed to the government. “I’m going to be very strict with this, and I have given precise instructions in order to avoid us being infiltrated” by fifth columns, Maduro reportedly said. An effort to cull disloyal elements within Venezuela’s armed forces would not be a new development, said Geoff Ramsey, the assistant director for Venezuela at the Washington Office on Latin America. Scores of personnel from various branches of the Venezuelan military have already been arrested and charged with treason so far this year, Ramsey said, but the government may see this case differently. 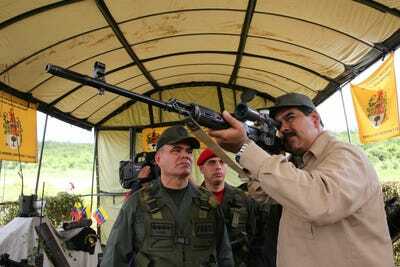 Miraflores Palace/HandoutVenezuelan President Nicolas Maduro takes part in a military drill in Charallave, Venezuela, January 14, 2017. Not all members of the military have benefited from those perks, however, and discontent has grown as the country frays. Despite changing sentiment, the latest crackdown seems unlikely to provoke a successful revolt. “I think the Maduro government has proven to be quite skillful in marginalizing and eliminating internal threats. They have dismantled every attempted military uprising so far, resisting tremendous pressure,” Ramsey said.